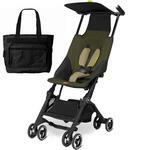 The World’s Smallest Folding Stroller! With its exceptional design innovation, the Pockit is the 2014 Guinness World Records™ most compact stroller. When folded, it is the smallest and most compact stroller currently available on the market, 11.8" x 7" x 13.8" to be precise. For parents with a passion for city travel and exploring, the Pockit is the quintessential choice. With the ability to switch from pushing to carrying in seconds, its ideal for trips by train, plane or simply visiting your favorite cafes. Designed for frequent travelers, the gb Pockit Stroller in Monument Black quickly folds into an ultra-compact package shaped like a handbag for simple transport on airplanes and more. The stroller offers a self-standing folded option for added versatility when you and baby are dining out. When in use, the Pockit offers a height-adjustable harness that is easy to tighten or loosen to secure your little one properly. Front swivel wheels make maneuvering simple, and you can lock the tires for stability when strolling along uneven paths. 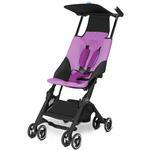 Easily push your little bundle of joy with one hand in this compact stroller. The cleverly designed, compact fold uses the 2 x 2 D technique. 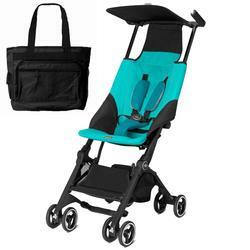 This means that in only two steps, this unique stroller folds up into a compact, feather-light, handbag shaped package (9.5 lbs). Perfect for when you are on the move, and practical and easy to stow away when you’re not. It even fits into any plane or train overhead compartment! Built using durable materials and expertly designed, the Pockit is small and light, but holds a child up to 55 lbs. The convenient storage basket holds up to 11 lbs of gear. Recommended weight: Up to 55 lb.